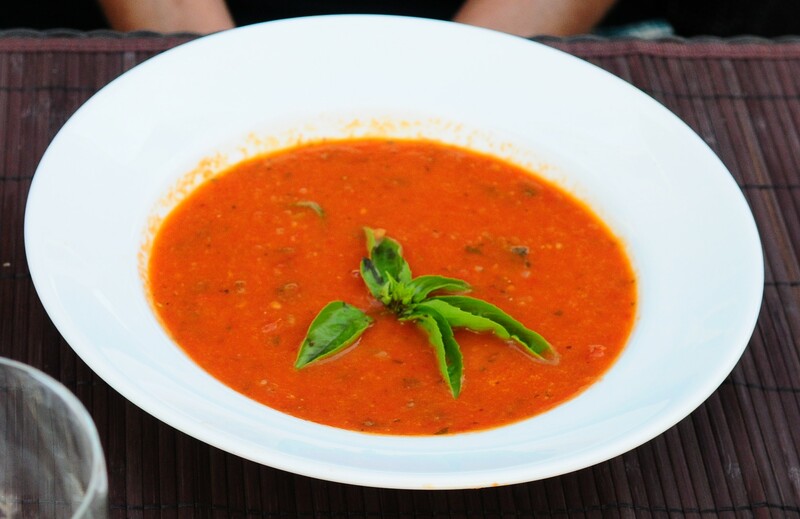 This soup is worth the effort, especially now when the ingredients are all fresh, local and in abundance! Tomatoes… I think I planted a few too many this year, though there is nothing that tastes so wonderfully fresh than a tomato! I have diced and measured out many bags for the freezer already and I know I will be glad when January rolls around and grocery store tomatoes just don’t taste like tomatoes anymore. Beans- Cover the dried cannellini beans with a generous amount of cold water in a bowl overnight. (make sure the water is at least 2 inches above the level of the beans). In the morning, drain the water and put beans into a good sized pot with fresh water, again covering them with water by at least 2 inches. (If you are using fresh or canned cover with water- start now) Add the bay leaves, squashed tomato and potato. Cook for 30 minutes to an hour (less if fresh or canned) or until tender and soft but not mushy. Keep an eye on them making sure there is water always covering them, and check by tasting after about 25 minutes to see if they are done. Drain, reserving about a cup of the cooking water, and remove and discard the bay leaf, tomato and potato. Season with the salt and pepper and a splash of olive oil and set aside. While the beans are cooking, heat a glug of olive oil in a stock pot and add the onions, carrots, celery, fennel, garlic and the finely chopped basil stems. “Sweat” on low heat, with the lid left ajar for about 20 minutes until soft, but not brown. Add the diced tomatoes, zucchini and red wine and simmer gently for another 15-20 minutes. Add the chard or spinach, vegetable stock and the seasoned beans. Put the dried spaghetti pasta into a plastic bag and gently bash with a rolling pin to break the pasta into pieces. Add to the soup pot. Stir and continue to simmer until the pasta is done. If the soup is too thick add a little more stock or the reserved bean cooking water to thin it down. 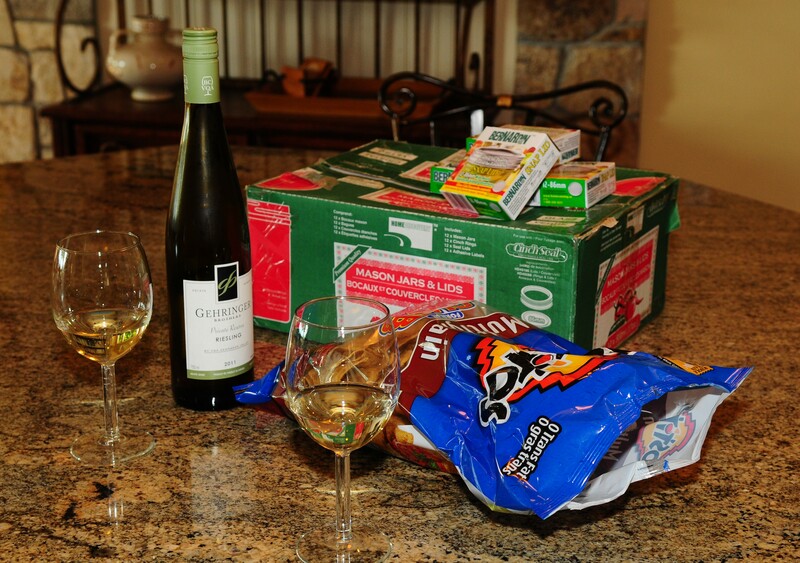 Season to taste with a little more salt and pepper if needed. Serve with torn up Basil leaves, a little grated Romano cheese and a few drops of hot sauce. Yum! Posted in Lunch, Soups Can Be A Meal, What's for Dinner? My friend and I have been making salsa together for at least 10 years every Fall when the freshest local tomatoes and hot peppers are in season. It has become a tradition that we look forward to not only because we then enjoy amazing salsa all year round, but because we enjoy spending time together talking about life. Over the years we’ve shared our hearts about our kids, our marriages, lost jobs, cancer, to sell or not to sell a wedding dress, our fears and the things that bring us joy. Friends need each other. I am blessed to have that kind of friend. I encourage you to call a friend and start a tradition. Spend time together making salsa…a tradition we are passing on to our daughters. What you will need to make 27-28 (500ml) jars. * A note about hot peppers. Our salsa has some spice, though mine is a little less than my friend. It will all depend on your family and how much “zing” they want. Compared to a store bought salsa, mine would be medium. If you like it “hot” just add a few hot peppers more with the seeds in. 1 bag whole grain tortilla chips (optional) for tasting. * A note about chopping. It will depend on how chunky you want your salsa. Over the years we have experimented with many different mechanical devices and have found that we prefer to hand chop most everythings except the onions, the garlic, the cayenne and chili peppers. 1. Hand chop tomatoes and add to the pot. Then add the spices and sugar and turn on to a very low simmer. 2. Start chopping all other ingredients and add to the pot as you go leaving the hot peppers until the end. We usually start with the sweet bell peppers, then the onions and garlic and then we put on the gloves for the rest. Stir after you add each new ingredient being careful it doesn’t stick to the bottom. Adjust the temperature as needed. * A note about your stock pot. I finally bought a good quality stock pot this year because my salsa was always sticking to the bottom and some years burned at the bottom. It was worth it. I only wish I had splurged sooner. I also bought a “simmerpad” which sits on the element and keeps the heat more even and prevents burning. It worked like a charm for my friend, whose pot also has burned the bottom some years. We are using a gas stove. I am not sure if this makes a difference, but a low simmer to start is best, with the temperature increased just a little once everything is in. 3. Add the cornstarch to the vinegar, mix well and add to the pot. Stir until everything is combined and then make sure you simmer long enough to get it hot and almost boiling. 4. 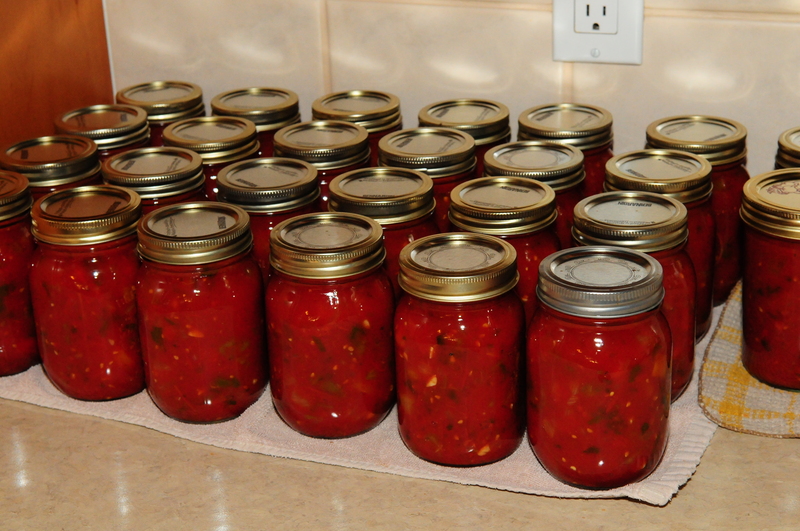 Meanwhile, prepare your jars for canning. We run one batch through the dishwasher while the other already clean jars go into the oven for 10 minutes at 225 degrees. 5. 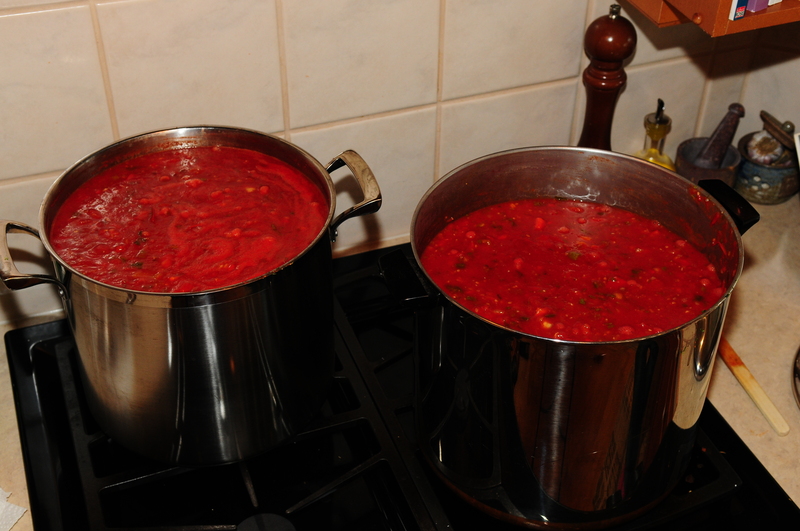 Put on a pot of water and add your new canning lids (one batch at a time) and heat to just a boil, then remove from the heat. We celebrated our 25th Wedding Anniversary on September 5 and with that day has evolved an amazing family tradition we started 9 years ago when Rachel was 14 and Kirsten was 11. The girls cook and serve us a special dinner restaurant style. They plan the menu, buy all the groceries (I was sent out with a list before they could drive:) cook the meal from start to finish, set the table, serve us and then clean up. The menu has become more and more amazing and complex every year and every year we say it was the best one yet! This year was no exception…6 courses with wine and so delicious. What a blessing! 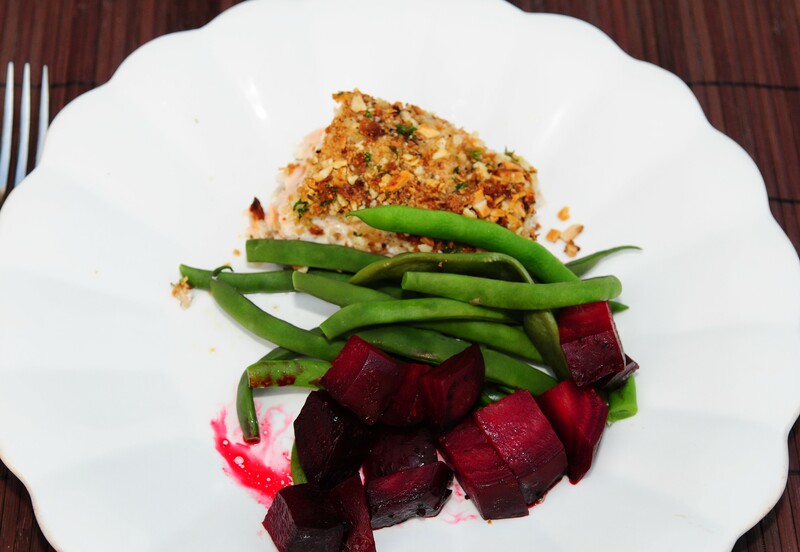 What I love the most is the effort, the desire to serve us and the love that both our girls are developing for cooking healthy, delicious meals from scratch. More and more they are searching for recipes that include the freshest ingredients that are in season either growing in our own garden or at the local markets. 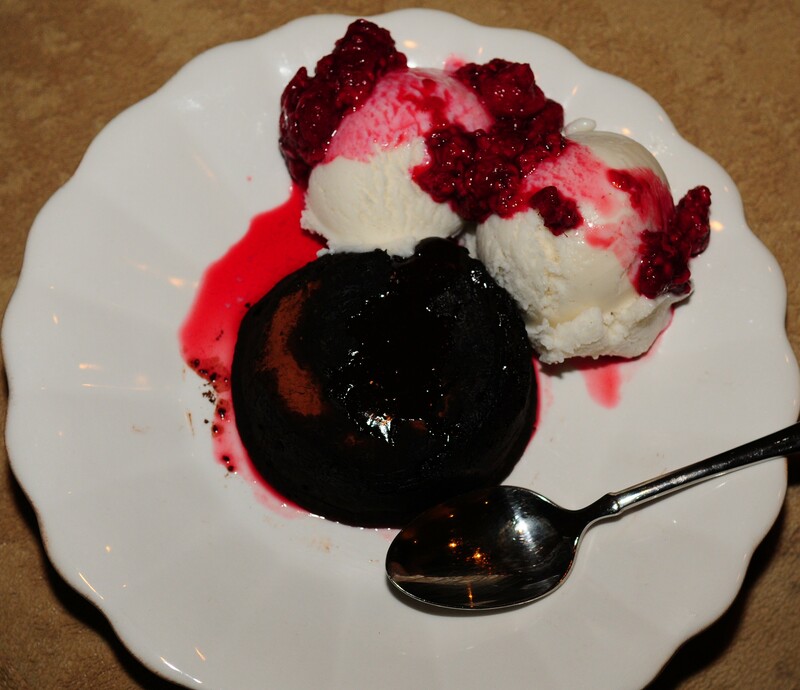 and a family favorite dessert, “Chocolate Lava Cake served with Raspberries and a scoop (or two) of Soy Ice Cream”. Hummus…Finally a recipe we love! Heat a splash of olive oil in a pan on medium-low heat. Add chickpeas and garlic and sauté slowly, stirring often for about 5-8 minutes. Remove from heat. Add to food processor or blender or with a hand blender, the sautéed chickpeas and garlic, tahini, lemon juice, olive oil, ground cumin, salt, yogurt and red pepper sauce. Pulse until combined then gently blend until smooth. Serve immediately with toasted pita bread or fresh cut vegetables as a dip. Refridgerate for up to 2 weeks. Chop garlic, jalepeno in processor. Add cilantro and puree. Blend in salt and oil. Drizzle about half of the pesto around edge of hummus. Freeze the rest in ice cube tray. Place all of the ingredients in a food processor and process on high until an even, smooth consistency is reached. 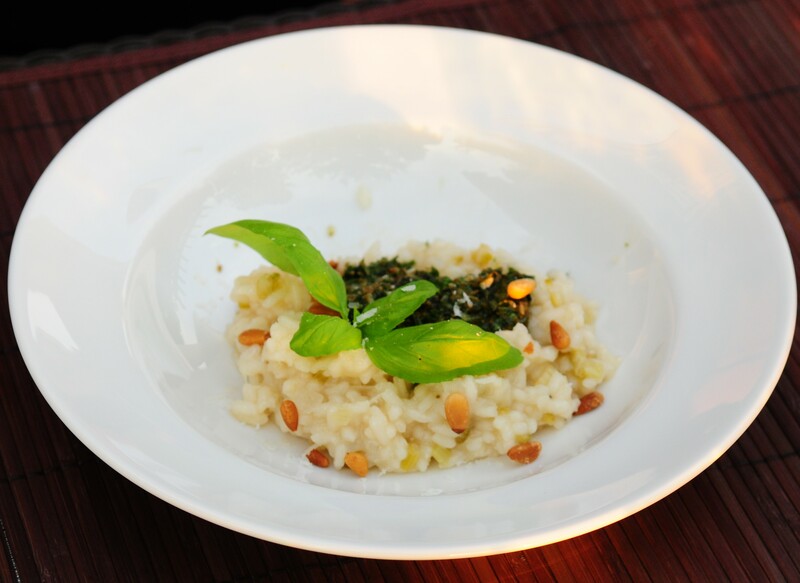 Transfer to a bowl and garnish with fresh sprigs of basil. Serve as an appetizer on toasted sliced baguette, pita bread or crackers. This cake is decadent, delicious, dairy-free and is a family favorite on special occasions. I was amazed the first time I was served this yummy cake…and even more amazed that it turned out when I first tried it. Baking is not really my speciality, but this cake has never failed. Just a few tips before you try it… You really do need to use 8 inch springform pans. I went out and bought 2. I like to use parchment paper instead of greasing the pan. A little tip I picked up from somewhere is to first run water over your crumpled sheet of paper, then squeeze out the water and then line the pan. I have cut down the maple syrup from the original recipe (1 cup)…I think it could even be cut down more:) but since this is a rare treat I have left it at 3/4 cup. And finally, it is worth buying a good quality chocolate chip for the ganache…it really makes a difference. Serve with a scoop of vanilla soy icecream if you want to keep it all dairy free or with your favorite vanilla ice cream or frozen vanilla yogurt. I finish it with a couple of tablespoons of delicious raspberries. Enjoy! In a large mixing bowl, mix together the flours, baking powder, baking soda, cocoa powder, salt, cinnamon and brown sugar. In a separate bowl beat together the water, the soy milk, maple syrup, oil, vinegar and vanilla and almond extracts. Pour the wet ingredients into the flour mixture and beat on low until well combined. Divide the batter into 2 parchment paper lined 8 inch springform cake pans. Bake for 35 minutes or until a toothpick comes out clean when inserted into the center of the cake. Remove from the oven and let cool on a wire rack completely before trying to peel the parchment paper away from the cake. To prepare the ganache, put the chocolate chips, soy milk, coffee and maple syrup in a double boiler over simmering water. Once the chips are melted, remove from the double boiler and set aside to cool. Transfer to a blender or magic bullet and blend for 1 minute. Cool for about an hour in the refrigerator. Place one cake layer on a cake plate and spread an even thin layer (approx ½ in) of raspberry jam or ganache frosting. Place the second cake layer on top and frost the entire cake.